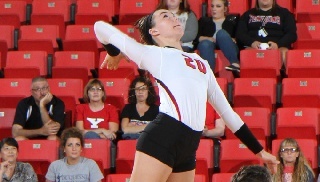 Youngstown State sophomore outside hitter Sam Brown posted a career-high 18 kills in the Penguins' four-set loss to Green Bay on Thursday evening in the Horizon League opener for both teams. The set scores were 25-18, 17-25, 25-18, 25-20. Brown added 10 digs for her fourth double-double, and Aly Ryan added 10 kills. Nikki Thompson posted a match-best 22 digs, and Jessie Gerig was close behind with a career-high 19 for YSU (5-10, 0-1 Horizon League). Megan Powers had 15 kills, and Beth Kuske came off the bench to register nine kills and a match-high five blocks to lead Green Bay (10-5, 1-0 Horizon League). The teams battled through 27 ties and 12 lead changes, and a large chunk of that came in the fourth set. After the score was 1-1 in the opening set, Green Bay scored the next two points and led the rest of the way. Brown had seven of her kills, and YSU hit .308 collectively in the second set. Brown had four kills during the Penguins' 11-3 run in the set that put them ahead 20-14. The third set was tied six times early before the Phoenix went on a 9-3 run to go up 18-12. There were 12 ties and seven lead changes in the fourth set, and the largest lead by either team was two until Samantha Anthon's kill put Green Bay ahead 20-17. That capped a five-point spurt by Green Bay, and the Penguins were never able to catch up. The Phoenix ended up outscoring YSU 10-3 down the stretch, and they had three blocks in that span. Youngstown State will remain home to host Milwaukee on Friday at 7 p.m.